A Rival with no real rival. Not the cheapest mouse, and there are minuscule niggles that we could pick holes in, but it’s an incredible performer where it counts. Balance, as we all know, is vitally important. Without it, we wouldn’t have Segway polo, giant Jenga, or standing up. Does the world of mousing really need a big emphasis on balance, though? Does it need 256 possible levels of side-to-side balance adjustment? 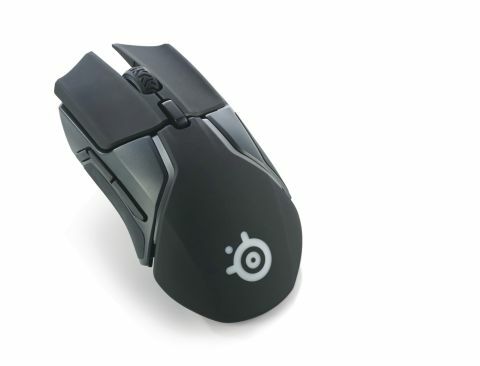 Science has perhaps not advanced far enough to tell, but that’s what SteelSeries is offering with the Rival 600: a series of eight 4g (about 0.15oz) weights, with eight possible positions to place them (or not place them), four on each lateral edge of the mouse. Pull them all out, and the mouse is light and skippy; stuff them all below the detachable side panels, and it’s, predictably, just over an ounce heavier, with a weightier glide. Depending on your particular right-hand stance (the left-mounted thumb buttons mean this mouse isn’t ambidextrous), shifting the weight forward, back, or to either edge can make lifting more efficient and help to reduce bad habits—or at least, that’s the theory. In practice, this didn’t feel to us much different from the usual base-weighted mice, but your own mileage may vary. We preferred the Rival 600 fully loaded, because it’s not only made for balance; it’s meant to be ultra-accurate, too. Tracking error when even slightly lifted is basically zero, thanks to the combination of the same TrueMove 3 sensor we’ve seen in SteelSeries’s Sensei mouse and a secondary lift sensor, which can be set to trigger at a custom height. It’s remarkable and a little unnerving, but there’s no cursor drift whatsoever. Capable of resolutions up to an unuseably sensitive 12,000 CPI, the TrueMove 3 was already floating around the top of our sensor leaderboard, and it’s even better here. If you end up pointing at something you didn’t want to point at, that’s entirely on you. Palm grip aficionados may not get on well with the placement of the front-most thumb button. Held comfortably, it’s placed just too far forward to reach without shifting the hand, which isn’t ideal in a firefight. To be fair, it’s more than reachable in claw grip, at which point the rear-most button demands a painful twist of the thumb to access. You can’t win. But, at least, there are two accessible side buttons, no matter what your preferred hold. Each of the main buttons is molded independently of the Rival’s main body, and afforded a microswitch of just about perfect weight, resisting resting-hand misclicks without any trouble, but remaining light enough to stop your fingers tiring. The wheel, coated with tire-track silicon and nicely notched, takes a fair amount of force to press down; behind it, the two-level resolution toggle is raised just enough that it can be clicked with the second knuckle of the middle finger. While much of the design work has clearly been focused on control, as it should be, SteelSeries has not forgotten the aesthetic side of things. There’s a good swathe of RGB lighting running from the edges of the mouse wheel down side panel-hugging strips to an illuminated logo on the base, all compatible with SteelSeries’s excellent Prism lighting system. This means you can sync up your compatible gear, and even get visual notifications from the likes of Discord via your mouse, because you need that. Everything’s beautifully coated in that grease-magnet soft plastic finish that tends to wear away and get sticky after a few years’ solid use (so bear that in mind), and there’s an extra dash of silicon on the base of each side grip, adding to the luxury feel and the sureness of the grip. The cable’s not braided, but it’s replaceable, so we won’t dock it any points. In fact, it’s a real struggle to mark down the Rival 600 at all. It’s not the cheapest mouse, and there are minuscule niggles that we could pick holes in, but it’s an incredible performer where it counts. SteelSeries’s design resurgence continues apace—we’re just waiting for the Danish hardware wizards to lose their balance. Too cheesy?